Copyright Â© ERYICA 2018. All rights reserved. One of ERYICA’s most important tasks is to make the work of our members visible - work that they do for the benefit of, and in cooperation with, young people, as well as in cooperation with other partners and stakeholders. Behind all this also lies fruitful collaboration with local, national and European partners and stakeholders. The task of both the Governing Board and the ERYICA Secretariat is to promote the dissemination of good practices and tools through a variety of different channels. 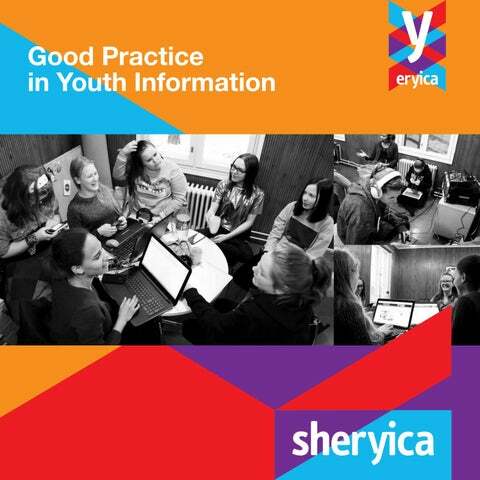 Every two years, ERYICA publishes a Sheryica Good Practice Booklet, which presents a large selection of quality examples to be adapted within youth information and counselling services. All our members have the possibility to share tried and tested models and methods for the benefit of the whole network. This supports the sharing of good practices in the youth information and counselling sector, and enables necessary professional peer support. The publication includes all the necessary contact information in order to facilitate the exchange of ideas between organisations. Networking and sharing information play a major role in developing the themes important to youth information and counselling, as well as in our efforts to reach young people more effectively. The 2018 Sheryica Good Practice Booklet is the 5th edition of the publication. We have highlighted interesting and topical issues: media and information literacy, youth information outreach to disadvantaged groups, digital youth information and counselling and youth participation and empowerment. These themes are also highly compatible with the principles outlined in the Youth Information and Counselling Charter adopted in Cascais, Portugal on 27 April 2018 by the 29th General Assembly of ERYICA. Services should be developed in directions that promote youth empowerment and participation. Services must also support young people’s ability to assess and make use of information. With the help from the examples presented in this publication, we have an excellent opportunity to develop youth information and counselling services based on young people’s need for information. I would like to thank you all for your amazing work. It is a great privilege to be part of this network. Learn from one another and enjoy your work together! Media and Information Literacy Youth information (YI) incorporates a wide range of initiatives, including orientation, guidance, training, listening, support, documentation and awareness-raising, with the aim of informing and supporting young people to become autonomous and wellinformed citizens. Youth information allows young people to develop their critical thinking skills and think about the process of researching and analysing information. It supports them in their decisionmaking by enabling them to make informed and appropriate choices. Youth information provides information and materials from a wide range of sources (government agencies, associations, business services to name a few), based on European and national charters that set ethical and professional principles and guidelines. Only young people who are properly informed of their rights and duties can act as enlightened citizens and find their place in society. This is why it is important for the youth sector to anticipate the needs of young people, using preventive actions on important societal issues. The pedagogy of generalist youth information is not limited to the transmission of knowledge (information) but also aims to promote the appropriation of this knowledge, support the development of skills and competences of young people to become autonomous, active and critical citizens of society. YI is designed and coordinated by trained professionals who are in direct contact with users. YI professionals allow a physical connection to remain: they give meaning to the demands, expectations and needs of young people. However, YI also has the capacity to support the current shift towards digital medias in the field of non-formal education. YI has the skills for dealing with the mass of information generated online as well as media education. Information literacy is a sure way to enlighten young people and stimulate open, inclusive, positive and constructive attitudes and worldviews. It is therefore essential to provide various audiences, especially those who are most vulnerable, such as young people, with reliable educational means. Information literacy is also about helping young people to develop the skills needed for “good use of information” (UNESCO, 2012). These “informational skills” are defined as the range of skills that enable individuals to determine when they need information, how to find it, to evaluate it, and finally to use it according to their interests. Coaching young people on how to search for and analyse information for their own situation, and to make the most of it, is therefore part of the “basic literacy” of every citizen. One of youth information’s missions through information and media education is to make young people aware of the advantages and disadvantages of digital information, the Internet and social networks. The aim is to ensure that young people learn to discern reliable and unreliable sources of information, understand the reasons and mechanisms behind this classification, and use the web, like any other medium, using their critical thinking skills. Media literacy, or “e-literacy,” will enable young people to benefit from information in multiple formats, including digital, from a wide range of sources, and to interact responsibly, creatively, and autonomously. Description: Donegal Youth Service has a team of experienced staff who facilitate a mixture of ageappropriate workshops and seminars to children, young people, parents and teachers. These sessions are available at both primary and secondary level, as well as to other education providers and community/sports groups. For the younger children, we employ a methodology that incorporates puppetry and circle time discussions, whereas with teenagers and parents/ teachers we use a multi-media methodology. Our sessions last about 20 minutes for 5 to 8 year olds, 45 minutes for 8 to 12 year olds and 70 minutes for secondary school pupils and parents. The sessions are designed to get young people thinking about this topic. We aim to encourage young people to improve their empathy and to develop â&#x20AC;&#x153;positive online behavioursâ&#x20AC;? and become more aware of risk-taking behaviour and associated dangers. We can never ensure that a child or young person will never be cyberbullied: BUT we can ensure that we empower them with the knowledge and information to deal with it appropriately if it does happen. Instead of cutting ties with those who emigrated, “Man 20-keli” attempted to provide them with a chance to tell their stories and showcase the diversity of career opportunities and creative paths for young people in Lithuania. Spending time and resources for youth is often seen as inconvenient and expensive. Active participation requires the will to take risks and the courage to modify plans. Hyvinkää´s Youth Services, co-funding with The main aim of the More(social)media! -project was to develop information and counselling the Regional State Administrative Agency services online and promote active participation through digital youth work. Youth workers of Southern Finland designed the project plan, applied for funding and were in charge of using it. Activities were carefully planned to fit the environment and the intended goals. The youth workers arranged events for young people to provide them with the possibility to engage, to explore and September 2016 to September 2017 express themselves. We developed information and counselling services and digital youth work through the active participation of young people – or did we? Who is we? One year into the project - in September 2017 - the content and the goals of More(social)media! were re-written by young people. The original aim stayed the same, but the methods, strategy, networks, applications used, environment and time frame changed. Instead of expecting young people to enter into our comfort zone, we – the youth workers- entered into theirs. By doing so, we managed to establish a common way of providing information, arts and events with young people, to everyone. By embracing non-formal learning and using digital tools to connect and engage, the project managed to enter the digital environment, predominantly made up of young people, and develop youth information and counselling services online. Achievements: In digital youth work, sharing is more than just clicks and likes on social media. It is embracing interaction, and most of all â&#x20AC;&#x201C; it is finding a sense of belonging and people you appreciate, and who appreciate you. It is easier to engage and share when you can relate to the content and know that you are not alone. For the promotion of active participation and youth empowerment, the establishment of an inclusive and interactive way of providing and producing information, media, arts and events with young people is crucial. To do so, young people and youth workers need to identify each otherâ&#x20AC;&#x2122;s interests, aims, challenges, hopes and dreams - which requires trust, interaction, effort and time. Therefore, we stop often. We wonder together â&#x20AC;&#x201C; get lost together, we solve challenges and have our small victories. A youth worker is involved in all stages as a participant and support, rather than as an administrator. Before September 2017, young people participated in face-to-face activities on average 36 times a month, after September 2017 the number is 131 (and increasing). Many of the new participants have joined the project first through digital channels, and later face-to-face. From September 2017 to March 2018, the posts of the More(social)media! -project reached 155,720 people overall, and 0% of our budget was spent on advertisements! We have learnt that the development of online information and counselling services and digital youth work through the active participation of young people requires a lot of resources and time. Youth workers should not spend these resources for young people, but with young people. ‘Digi,Aye? covered hot topics including staying safe on social media, safe browsing and access to the Internet, protecting your digital identity, making purchases online, how to have a ‘digital cleanse’ and online dating. Digi, Aye? is a play on a Scottish saying, ‘did ye’ (did you) ‘aye’ (yes), a friendly saying in Scotland when you express disbelief about someone’s unbelievable story. This playful branding gave ‘Digi,Aye?’ the feel and tone of a Young Scot campaign to ensure young people engaged with the content and themes. Launched in September 2017, Young Scot created a dedicated digital platform (www.young. scot/digiaye) to host and curate relevant information and content, and act as a central hub for activity. Young Scot then published content daily across the social media platforms most used by young people in Scotland. This multi-platform approach ensured visibility and reach across all the major social media platforms: Snapchat, Instagram, Instagram Stories, YouTube, Facebook and Twitter. To keep up the momentum, a wide variety of different content types were used including written articles, infographics and videos raising awareness of online security. Much of the content was created with young people and their voice was integral to the campaign. Young Scot Rewards users were provided with points for accessing ‘Digi,Aye?’ content and this was promoted to over 100,000 Young Scot Rewards users. Each month the campaign had a different focus tie the campaign into the issues facing young people and key calendar moments. Working with students ‘Digi,Aye?’ worked in collaboration with Gillian Martin, a Member of the Scottish Parliament for Aberdeenshire East, to fund a group of students from North East Scotland College (NESCol) to make two films about the implications of sharing explicit digital images. The films were scripted, edited and produced by the students, who hired local young actors to bring difficult themes to life. The completed films were presented to the Scottish Parliament at a dedicated parliamentary reception during their Safer Internet Day in February 2017. This work brought an extra dimension to ‘Digi,Aye?’, adding the voices of young people via the medium of visual storytelling. The films are available to view on the Young Scot website, YouTube channel and across our wider social media platforms. To date, the films have been viewed more than 70,000 times across different platforms. Youth information outreach to disadvantaged groups The Committee of Ministers of the Council of Europe Enter! Recommendation (2015) proposes the development on policies taking into consideration the specific situations and needs of young people from disadvantaged neighbourhoods. Such policies should aim at preventing and eradicating the poverty, discrimination, violence and exclusion faced by young people. In March 2008, the European Commission organised a conference in Brussels on the topic of ‘Participation of young people with fewer opportunities’. The conference participants presented good practices in working with disadvantaged young people, and highlighted the importance of several key issues: •	Youth workers called for better exchange instead of a one-way monologue from administrative bodies. They underlined the importance of mutual understanding, cooperation and coordination of activities between policy-makers from the European Institutions, national governments and people working directly with disadvantaged young people; •	Participants called for more involvement and empowerment of young people together with an enhanced consultation process with youth workers; •	There was recognition of the need for flexibility and a tailor-made approach when looking for appropriate solutions, taking into consideration the particular situation of the disadvantaged young people concerned; •	It is important to build long-term relationships when dealing with young people with fewer opportunities. Working with youngsters is a long-term process, which does not necessarily bring about quick, short-term outcomes; •	The equal engagement by all Member States is absolutely crucial when tackling problems of social exclusion of disadvantaged young people. (source : http://europa.eu/rapid/press-release_MEMO-08-148_en.htm?locale=fr ) Going back to the basic principles of our network, two very important principles of the European Youth Information Charter, adopted in 2018, are respectively: •	Youth information services are open to all young people without any form of discrimination. •	Youth information centres and services strive to reach out to all young people, in ways that are effective and appropriate to different groups and needs. This highlights that outreach to disadvantaged groups of young people is a key issue for youth information and youth work in general. In the following chapter, we will present good practices from our members who have vast experience in this field. Who are these young people that we define as disadvantaged? What are their specific needs? Which are the projects and strategies that help us to reach them with a positive impact? In view of the diversity of the groups that could be included in this category (economic, geographical, social, physical, psychological...), there is no straight-forward roadmap to give the right way to outreach to disadvantaged groups. However, the following concrete experiences could, without a doubt, have the capacity to inspire and guide youth workers who want to develop a specific focus on outreach to disadvantaged groups. The trainings in universities took place in October and November 2017. The second part is scheduled to take place in October 2018. The total number of participants at the end of 2017 was 250 with a final goal to reach 600 by the end of 2018. Description: The youth information offices promoted and hosted a campaign organised by the Programs for Psychosocial Empowerment of Youth “Mikri Arktos” of the Youth Board of Cyprus. The training campaign was inspired by the 2016 International Mental Health Day, and its aims were in accordance with the World Health Organisation and the European Council’s efforts and aims in reducing suicide and depression among young people. The training was designed to train and educate young stakeholders in recognising an emotional crisis (including those that emerge due to everyday issues and accidents) and give them the basic knowledge and skills to handle (emotional) crises. The programme started with presentations given by a university professor in the field of Psychology and two youth officers. The purpose was to introduce participants to terminology such as what is a crisis, crisis intervention etc. and to talk about the most important skills one should implement when facing a crisis situation. Furthermore, an introduction to practical steps and solutions was presented. In the second part, all participants split into experiential workshops where they had the chance to share concerns, ideas, knowledge and experience. In the final stage, participants enacted role-playing scenarios of real life situations they could face and they role-played different ways of handling a (crisis) situation: being there for a friend in the first moments of a great loss, being a witness to a car accident where one of the passengers got a shock, being witness to a major tantrum of a child, handling a friend who is grieving for a divorce etc. This helped them to spot the difficulties of such a situation and advance their crisis management skills. Achievements: Participants learned what the term “crisis” means, what the “symptoms” are, how they can support a person who is in a crisis, how to establish good communication with them, how they can support them to overcome the crisis situation and refer them to an appropriate service for the next steps. The total number of participants at the end of 2017 was 250 with a final goal to reach 600 by the end of 2018. During the exchange, young people participated in workshops on solidarity, tolerance, human rights, the European Union, the No Hate Speech campaign, etc. and could spread their message among the visitors of Europe’s largest youth festival “We Are Stockholm” (http:// www.stockholm.se/KulturFritid/Ung-i-Stockholm/wearesthlm/). During the festival, youngsters organised activities, games, and a green screen photo to inform on the topics of youth exchange and other mobility possibilities within the Erasmus+ programme. The information was provided in different languages (English, Swedish, Spanish, Arabic, Dari, Farsi…) and the activities were implemented in such a way that the involvement of all the participants was enabled (for example, discussions in smalls groups, body language, photography, painting, using their own languages to spread information among visitors at the youth festival, etc.). Achievements: The active participation in a non-formal educational process developed young peopleâ&#x20AC;&#x2122;s skills, knowledge and attitudes, offering new opportunities for their future (languages, travel, studies, social and political engagement, work...). In Solna, some of the young people involved in the host organisation are young asylum seekers and refugees who have recently arrived to Sweden. This was an opportunity for them to develop their identity and become part of the Swedish group, assuming host responsibilities and working side-by-side with other established young people from Solna. They were inspired by our German participants, who are refugees and have arranged themselves to actively participate in German society. The project increased the young peopleâ&#x20AC;&#x2122;s awareness about migration, democracy and human rights by meeting people in different situations. It stimulated the creation of new networks and gave young people concrete tools for real participation in their local communities through empowerment, self-organisation, preparing workshops, expositions, organising debates, using online resources, etc. The participants improved their communication skills and were proud of the co-operation with other young people (who they usually donâ&#x20AC;&#x2122;t meet). This created a common feeling of belonging to a European identity. There were 40 young people directly involved and over 100,000 indirect participants. Description: Youth is the age of radicalism. Be it by conviction or provocation, the expression of radicalism among young people is the sign of a form of emancipation, which is part of the making of an individual. However, this “constructive” radicalism becomes tragic when an individual uses violent means in order to defend an ideology. In the context of the unprecedented wave of terrorism that Europe is now facing, radicalisation is a major challenge. Youth stakeholders are witnesses to the emergence of a vulnerable youth, which is sometimes disappointed, has a feeling of injustice, with a tendency to turn in on itself, to act in a disrespectful way, or even progressively turn to violent radicalism. Youth stakeholders aim to stay connected with these young people at risk in order to avoid that they dramatically move on to violent radicalisation. This responsibility requires professionalism, and it is now necessary for youth workers to have skills such as understanding the reasons behind violent radicalisation, as well as preventing and identifying first signs. Liaisons – A toolkit for preventing violent extremism through youth information (created by French-speaking members of ERYICA). That is why CIDJ (Centre d’Information et de Documentation Jeunesse), which is based in Paris, offers youth stakeholders a 2-day training on “preventing and identifying risks of violent radicalisation”. Achievements: Participants in the training acquire knowledge and understanding of a phenomenon that has many causes. At the end of the training, they are able to contribute to the fight against radicalisation by knowing how to prevent risks and identify signs of turning to violent radicalisation. So far 15 youth workers were trained in this first session organised by CIDJ, around 100 youth professionals will be trained on the toolkit by the end of 2018. Description: As well as running other projects about education and awareness, employment counselling or legal assistance, Movimiento por la Paz – MPDL Cantabria is a host organisation for refugees and the aim of the programme that we are developing is to offer multifaceted help to refugees. For that reason, we have a professional team, which includes a lawyer, a psychologist, a social worker, a youth worker, a Spanish teacher, and a career counsellor. Movimiento por la Paz – MPDL Cantabria understands that it is necessary for everyone to be aware of the situation of refugees, since it is the responsibility of our societies to try to give these people tools so they can live a dignified life again. This is the reason we try to involve young volunteers in the project. The tasks of the young volunteers are mainly focused on Spanish language classes, where they participate in individual educational and conversation sessions, and also in legal support, where several law students of the University of Cantabria participate, in order to provide the necessary support to refugees. Involving other young people who are participating as beneficiaries in some of our other projects; Empowering young people to develop skills of all kinds with people who may have serious difficulties; Training young people in legal tasks related to international law and with a social objective; and Bringing young people closer to the social reality that exists in Europe with the refugee crisis. We have also received feedback from our volunteers. Recently one of them said: “I felt that I had to do something about the refugee crisis and I am finding in Movimiento por la Paz the place through which to channel my desire to help people.” So far 30 young volunteers have participated in the programme in the whole region. Description: POMP is one of MISSS programmes that aims to reach out to first-generation immigrants and ensure their better integration by using youth information as a tool and outreach to individuals and groups of young people who have recently arrived in Ljubljana. The programme implements an integration workshop in elementary schools, intended to involve children and teenagers in the local school system and to provide them with knowledge of the Slovenian language. Furthermore, the young participants have access to information technologies for free, reading workshops and free entrance to museums, theatres, swimming pools, libraries and so on. This initiative has the advantage of motivating young immigrants to access education, inclusion and job-seeking. This project attempts to establish links with the immigrants’ home environment and home country, and also to involve family members in the process of integration, as they are important bearers of cultural and social values. Various workshops aiming to provide young immigrants with professional advice, intercultural communication learning, computer literacy and better general information provision are therefore also intended for their families. Achievements: This MISSS project aims to generate a number of positive achievements for the participants. Their social integration is enhanced thanks to their involvement in the local education system, as well as in sports and cultural activities. Moreover, assistance is provided to them for the exercise of their rights to health and social care. Similarly, participants are provided with assistance in solving housing issues, career and job-seeking guidance, computer literacy and help with education as an attempt to encourage their economic integration into the host society. What is more, the POMP programme offers these young immigrants assistance in regulating their status by helping with administration, raising awareness on their rights and duties, and offering sustained and continued education. By doing so, vulnerable members within immigrant families become more autonomous and the political integration of participants is enhanced. Involving participants in the local environment at the social, economic and political level encourages greater social cohesion, acceptance from local communities and reduces intolerance towards people in need. Digital Youth Information and Counselling It is interesting to note that we still separate the ‘digital’ world from the ‘real’ world – do young people view this separation in the same way? Maybe we should start to see digital as a range of tools we use, as a continuum of services from the “virtual world” to “face-to-face”. We should think more how services link and how we help young people navigate through the myriad of channels and have an active voice to present their experience and information as youth ‘experts’. At ProMo-Cymru, we have based our TEC Model (Transform, Engage, Communicate) on our experience over the last 15 years. Digital is certainly no longer new – it is what many of us do as part of our work. Recently we began to reflect that www.thesprout.co.uk, the online youth information, news and view service for young people in Cardiff, has now been operating for over 11 years as the online magazine for young people in Cardiff, and that the ‘innovative’ www.meic.cymru, the advocacy-based helpline for young people in Wales, has been operating for 6 years. I don’t think we can claim this as new anymore. The point is that innovation and development is constant and we are now on a journey with young people to discover and create. We are excited to see what that will look like. We have also reached the point that digital online does not mean your computer or even your laptop – we now mean our all-purpose communications device – your phone. We are already asking our digital assistant for information and to “get us in touch with”. We must continue to develop with young people as our guide. And yes, many don’t have a ‘smart’ phone – but many do and many more will do. Information is now multi-platform – the same info will be available on your computer or a public computer – or via a phone call to those able to access the online repository of information. Description: The Estonian capital hosted a mini-hackathon in the framework of the youth information fair Teeviit. Participants looked for answers to the question “As a young person, what kind of information do I actually need and in what form?” The main goal was to get input for developing the content and digital solutions for the Stardiplats (Starting Line) website. The youth participants had a chance to map and focus topics that were important for them in society, and to propose ideas about what shape and form to present information aimed at young people. The hackathon took place using both digital solutions and visualisation on paper. The youngsters were assigned six topics and divided accordingly based on the focus topics: studies, employment and career, youth work opportunities, relationships and security, health, and civic rights and responsibilities. The focus topics were mapped in the context of the study “Analysis for raising the availability and user convenience of youth information services” (2016. Ernst & Young). During the activities, youngsters came up with a great deal of issues where they felt information was not presented in a youth-oriented manner in Estonia, such as “What are the symptoms of depression?” “How to say NO?”, “Whom to turn to with a concern on a sexual issue?” “How long can one take time off from work?” “How to be more selfconfident?”, and “How to get out of friend-zones?”. In addition, the participants were also asked to generate ideas for conveying youth information to recipients by way of digital solutions. At the end of the hackathon, all the groups presented their results, pitched their ideas and introduced the innovative prototypes for digital solutions that could be used among young people. Achievements: Topics related to mental health rose prominently to the forefront, as did relationships and health. In total, young people mapped 52 issues according to the various topics, and these issues serve as the basis for developing content for the State youth information website Stardiplats (www.stardiplats.ee). A word cloud was generated regarding youth information consumption, and as a result it was found that most young people wish to get simple and concise answers to their questions, using video clips, graphs and posters to catch their interest. They also expressed their wish to get answers privately on more sensitive topics, and showed great interest in various chat box and app-type programmes that allow them to get a personal reply from a youth information specialist. As well as social media and the Internet, they consider personal communication important and lively discussions on different topics among friends, parents, school workers and youth workers. It is evident that young people often seek answers to their questions on some topics in English. According to them, this is because it is not possible to find answers in their native language for some topics. Young people also find it hard to distinguish between authentic and â&#x20AC;&#x2DC;fakeâ&#x20AC;&#x2122; information and thus searching for information is somewhat complicated. A second youth information hackathon was held in June 2018 around 80 young people participated. Description: The eight neighbouring municipalities of Satakunta (population: 2,000–85,000), also known as “the Bear Municipalities”, experienced similar problems in reaching out to young people, communication, and in implementing digital youth work due to the lack of time or technical expertise. It was decided in 2015 that to solve the problem, all the youth services in the Bear Municipalities would be put together under two websites: Nuokka.fi and Jeesari.nuokka. fi. Nuokka.fi is focused on spare time services, whereas Jeesari.nuokka.fi is a help service covering the topics of studying, health, and employment for instance. The purpose of the sites is to make it easier for both young people and adults working with them to find information about local services aimed at young people. One municipality is responsible for technical issues, and other operators of the site check that their content is up-to-date. Municipalities can equally focus on producing digital content with no requirements for technical expertise in updating websites. In conjunction with publishing the websites, Nuokkakarhu (“Nuokka bear”), the mascot of the site and youth work, designed by Aleksi Salminen, was inspired by Irish ‘SpunOut’ youth website’s campaign ‘Ditch the Monkey’. Nuokkakarhu’s personality is negative, passive, and grumpy, which reflects both the stereotypical Finnish mentality and ‘teenage angst’. The slogan of youth work is ‘Don’t listen to the bear’, which encourages young people to abandon the passivity of Nuokkakarhu and to participate. The phrases used by the character are written in the dialect of the Bear Municipalities region, and they always have a hint of tongue-in-cheek sarcasm. This appeals to young people better than being overly cheerful, and that is why Nuokkakarhu is distinctive from other similar youth work mascots. He has good intentions and wants to participate, even though he hides in a shroud of grumpiness and whining, just as young people occasionally do. The Facebook, Instagram, Snapchat, Twitter and YouTube accounts of the Bear Municipalities youth work were named after the mascot: @nuokkakarhu. The accounts are jointly managed by local young people, youth workers and other people who work with youngsters. The social media accounts are used by young people to get informed about interesting current affairs, offer a more entertaining type of content, arrange campaigns and to help young people to have an impact on services provided for them. Achievements: Nuokkakarhu has been accepted well, and young people like him. Creating common websites and social media channels is not in itself a sufficient implementation of digital youth work, as it requires constant learning and development. The youth workers of the Bear Municipalities are getting familiar with digital youth work, its related phenomena, and the new social media services used by young people in shared training sessions and experimentations. The Nuokkakarhu social media channels, young people’s working groups and the Finnish online youth participation service Nuortenideat.fi have helped us to collect young people’s views and opinions about developing digital youth work. At the moment this article was drafted the different channels counted the following number of visitors and followers: Nuokka.fi: 28,059, Jeesari.nuokka.fi: 21,103 and Instagram (@ Nuokkakarhu): 1,148. The original version of the article was published in “Digital youth work – a Finnish perspective” by Verke (2017). Verke is the national centre of expertise for digital youth work in Finland. The publication can be downloaded here: www.verke.org/wp-content/uploads/2017/11/Digital-youth-work-a-Finnish-perspective_web.pdf. Description: The Association for Education â&#x20AC;&#x201C; Mladiinfo International from F. Y. R. of Macedonia participated in the mYouth project as project leader, along with its 9 international project partners from Austria, Poland, Ghana, Senegal, Hong Kong, Spain, Italy, Bulgaria and Singapore. The mYouth Project (Mobile, Young, Opportunity, Unity, Technology, Help) aimed to enable young people to gain skills in developing mobile applications. The mYouth project was particularly dedicated to offering space for young people where they could benefit from a learner-centred approach and benefit from a new learning model â&#x20AC;&#x201C; eLearning. These skills were applied to the creation of mobile applications that solve local issues for young people and help to provide decent employment opportunities for them. Knowing how to code clearly comes as a valuable job skill, as reports and indicators worldwide show that the number of jobs for programmers and computer scientists is growing rapidly; these skills will be very much desired in the future and are an invaluable asset, even for jobs that do not yet exist. More than 15,000 young people worldwide participated in attempting to tackle issues concerning youth, education and employability with the development of mobile applications. Achievements: The project enhanced the knowledge of novel non-formal education methodologies and tools, with the use and development of mobile applications. It also provided the young participants and partner organisations increased knowledge and abilities on developing mobile apps, highly demanded on the labour market. 22 participants joined the kick-off meeting in Salzburg, Austria, and the evaluation project meeting in Singapore. 10 local mobile app camps involved around 200 young people that were inspired by mobile learning. Over 30 mobile applications were developed as products aiming to solve problems in the local community and inspire youth to action. The mYouth finalistsâ&#x20AC;&#x2122; mobile applications are available for download on Google Play/iTunes and other platforms. 2 or 3 finalists per country were selected between the 25 participants to join the Training on Android Mobile Applications and Business Modelling Development in Macedonia. These finalists did not only boost their skills in programming and business, but also improved their intercultural skills, team-work, analytical skills and leadership skills. Furthermore, at least 20 applications connected to the mYouth project competed for World Summit Youth Award (WSYA) and European Youth Award (EYA). Description: Peliydin (“game core”) is a group of three young people, who began their own YouTube gaming channel in September 2017. The group planned, scripted, shot, edited and marketed the channel with the help of youth workers. The main aspect of Peliydin is that young people learn how to make videos from scratch. The focus was also directed towards peer support and sharing information. Some of the group had made their own videos before, so they were also teaching each other during the process. The idea of making a YouTube gaming channel show together came from two youth workers, who asked young people to join the group. Peliydin planned and scripted the episodes from September to December, with the aim of publishing at least four episodes. Every episode focused on different topics in gaming culture. The final themes were: the popular Finnish YouTuber J0P, the mayor of the City of Jyväskylä Timo Koivisto, the local gaming company Zaibatsu Interactive and the video game Cuphead. The aim of this project was to enable young people to produce digital information material via video sharing networks, as well as share their skills with other members of the group. The project was very successful, bringing lots of information about entrepreneurship and working in the gaming industry and also in general. The last episode was published in June 2018. Achievements: Before the proper marketing began, the videos had already gained hundreds of views. Peliydin will continue to shoot Season 2 in autumn 2018. This kind of youth work activity has raised interest in different parts of Finland, so there is a hope that Peliydin will inspire other young people to produce their own videos with others! Youth Participation and Empowerment Information is an essential component of both the participation and the empowerment of young people. In a world that is quickly changing and developing, participation and empowerment are vital to ensure inclusive societies, services and democracies. Expanded outreach: Social exclusion and poverty is on the rise and this brings new challenges to participatory methods in democratic societies. Knowledge about opportunities for participation are essential for participation to happen. But when dealing with vulnerable groups, knowledge about such opportunities is often scarce. Enhanced participation through digital technologies, access to participation in rural areas and the creation of open and inclusive arenas for participation are needed to ensure that our most vulnerable groups have access to participation. Tailored methods: In order to encourage participation and empowerment for all, we need to use tailored methods destined for young people and vulnerable groups of citizens. Topics and methods used for spreading information on opportunities for participation are often not adequate or relevant for the target audience when working with vulnerable groups. The knowledge of the individuals invited to participate must also be taken into account, and methods adapted to ensure all groups have similar levels of prerequisite information. Feedback: Vulnerable groups are not often invited to participate in feedback or have their voices heard. Many groups of youngsters are represented by spokespersons that do not necessarily belong to the group in question. As young people often lack faith in political institutions, their voice is essential for the enhancement of the debate on youth empowerment and participation. The feedback given not only on their input but also on their willingness to participate empowers vulnerable groups and individuals. This also facilitates further engagement and participation among citizens. Description: The youth information and counselling system is growing in Lithuania. There is also a brilliant twist: it is happening with the initiative coming from young people themselves! Until 2017, the youth information and counselling system in Lithuania was first and foremost coordinated by the Lithuanian Youth Council (LiJOT), in 30 cities. Youth information workers were doing the counselling work alongside other partners, such as national libraries, NGOs, and open youth centres. There was only one youth information centre (YIC) running in Vilnius, the capital of Lithuania. In autumn 2017, the second YIC in the country opened in the city of Utena. As a rule, the establishment of such centres comes as a direct policy of the Government. In this case, the YIC in Utena was created mostly based on the needs and voluntary work of young people. From 2012 until 2017, youth information and counselling in Utena was based on peer-to-peer principles. Volunteers spent their free time informing youngsters about mobility and similar opportunities. However, the need for professional youth information was growing, and active young people started to seek to establish a youth information centre in Utena. The youngsters did all the work: they searched for and set up the premises and negotiated with the local municipality regarding finances and other tasks. As a result, they even created a work opportunity for a part-time youth information worker. The persistence, determination and true desire of the young people made this initiative possible. “As we are here today thanks to the initiative coming from youngsters, I strongly believe that the youth information centre will function successfully, as we can already see how necessary it is”, – the Mayor of Utena, Alvynas Katinas, drew attention to this during the opening ceremony. During the opening ceremony, the representative of Lithuanian School Students in Utena, along with the president of the Lithuanian Youth Council, said that it is more than thrilling to have a YIC opened where there is a real need – in a relatively small town. The mayor of Utena promised to ensure continuous collaboration with young people and to uphold the activities and events organised in the centre. Achievements: The youth information centre is open for every young person, does online youth information work, and organises events that gather local youngsters in order to promote the activities in the centre. Youth information services in Lithuania are expanding due to the needs and energy of all young minds. Their horizons are open without any limits: understanding peers and bringing youth information where it is required and appreciated. Description: aha plus is an online-based recognition system for young people who engage as volunteers beyond their ordinary membership activities in an association or an organisation, in their municipality or in an initiative. For example: the musician Alex attends the rehearsals of his band every week. He is also responsible for the website of the band and for this webmaster activity he gets points in aha plus. In order to be able to collect points, young people need an aha card and their association or initiative must be registered at aha plus and publish its activities online. The young person can exchange the collected points for so-called rewards, for example, a job-shadowing in a well-known company, a meet-and-greet with a famous person or concert tickets. As well as the opportunities which aha plus offers to young people who are already active in an association, the tool also helps young people who would like to do voluntary work to find appropriate tasks. It gives organisations the opportunity to promote their activities among young people. The toolâ&#x20AC;&#x2122;s special selection opportunities allow associations to find suitable young people to find interesting activities. Achievements: Networking: aha plus was developed in an intense participatory process with associations, institutions, experts and young people. This intergenerational and interdisciplinary exchange made it possible to develop a custom-built platform. It also saw the people involved coming together, exchanging ideas, and gaining a deeper insight into the diverse field of voluntary work in the region. www.ahaplus.at: The online-based recognition scheme aha plus has been working since November 2017. Since then, 220 associations and 1,500 young people have registered and used the platform. aha plus is custom-built to young people and is meant to offer them not only recognition for their engagement but also opportunities in the fields of employability, social competence, experience, community and integration â&#x20AC;&#x201C; fields where you can learn only by doing and not theoretically, fields that have an impact on life as a whole. Manual: The Strategic Partnership in the framework of the EU programme Erasmus+: Youth in Action with Young Scot resulted in a detailed manual about the development, process, functionality, lessons learned etc. This manual is provided by aha. Youth Participatory Budget Portugal (OPJ) is a process of democratic participation, promoted by the Government of Portugal and coordinated by IPDJ, in which citizens between the ages of 14 and 30 could present and decide on projectsâ&#x20AC;&#x2122; public investment, with a total amount Government of Portugal. Coordinated by Portuguese Institute for Sport and Youth (IPDJ) of 300,000â&#x201A;Ź. According to the Government of the Portuguese Republic, younger citizens are a crucial part of Portuguese society, so it is intended that they are increasingly involved in collective decisions, while at the same time maintaining a vigilant attitude regarding the performance of public bodies. This initiative, which took place in 2017, aimed at contributing to the improvement of democracy by strengthening the public participation of young citizens and by encouraging the creative spirit and entrepreneurial potential of the Portuguese youth. This is also a national experimental process, as there is no knowledge of others having been organised elsewhere at national level. Nevertheless, this national project was inspired by local initiatives that take place in municipalities, in which the participation of Portuguese youngsters is fundamental. The meetings took place during the month of October, throughout the country. These were the face-to-face presentations and debates on proposals at national and regional level, as well as clarifications and assistance to young citizens who wish to participate actively in the process of OPJ. Achievements: 167 projects were presented in the following areas: Inclusive Sports, Science Education, Social Innovation and Environmental Sustainability. 167 projects were voted on online from 27 November to 22 December, divided into the four mentioned thematic areas. Young people, from 14 to 30 years old were able to vote for their favourite project by SMS and the opjovem.gov.pt platform. The 7 winning projects were announced at a public presentation of results on 8 January 2018. Description: These three Students’ Empowerment and Motivation Summer Schools, which were organised and held by the youth information centres in Nicosia, Larnaka and Limassol, aimed at developing the young participants’ skills and thus contributing to their personal and emotional growth in order for them to be more efficient as students and subsequently become more active. Each Empowerment School lasted 2 weeks, during which a total of 55 young people aged between 14-17 years old had the chance to participate in various workshops under the guidance of experienced speakers and coaches from all over Cyprus. These workshops focused on social skills development, team-building activities, self-esteem boosting, decision-making skills, stress management tips, critical thinking, robotics, theatre plays, web tools, scientific experiments and sports such as archery. A knowledge treasure hunt was also organised, as well as educational field trips to museums and historical tours in the old city centres of Nicosia and Limassol. A highlight of the Empowerment School that was organised in Larnaka was the “Meet the professionals, meet the job” activity, during which the young participants had the chance to meet professionals, such as doctors, a pharmacist, lawyer, journalist, museum curator, linguist, geologist, IT programmer, artists, whom they interviewed in order to better understand their profession and thus conclude if they are interested in following it as well. Achievements: Participants in these Summer Schools had the chance to develop their personal skills, reinforce already existing personal traits, gain confidence, manage stress, explore and delve into new areas of knowledge and socialise. Description: The network of youth information centres in Czech Republic cooperates in many ways. The Czech Ministry of Education, Youth and Sport has allocated a budget for youth information centres. In order to apply for funding, each youth information centre should suggest a project which will bring advantages to the whole network of Czech youth information centres. The national youth information centre (department of the National Institute for Education) coordinates all the projects to ensure their necessity for the whole network and the diversity of project ideas. In 2017, the youth information centre in Petrovice u Karviné applied with an interesting project about social entrepreneurship and young people. Social entrepreneurship is seen as a new opportunity for young people to bring their innovative ideas to life and, simultaneously, adhere to the principles of sustainable development. The first result of this project was the development of a publication called “Social entrepreneurship - an opportunity for young ideas” which is available online and free of charge. This brochure provides an overview of social entrepreneurship opportunities and the necessary tools for such a business. This publication also includes several examples of good practices on quality projects and innovation in social entrepreneurship from the Czech Republic and abroad. The youth information centre of Petrovice also organised a series of workshops for high school students in order to present the information from the publication. A training aimed at Czech youth information workers based on the publication will follow soon. After the training is put in place, other youth information centres will be able to run their own workshops for students and raise awareness about social entrepreneurship in their regions. Achievements: Social entrepreneurship can be one of the ways for young people to be useful and inspiring for society. This project also enables youngsters to learn about ways to bring their business ideas to life. The online publication introduces them to some successful business examples and useful tools. The workshop for students encourages and motivates students to engage in socially responsible projects and innovative businesses. The training for Czech youth information workers will ensure that young people across the country have the chance to be introduced to social businesses. So far 200 youngsters took part in the workshops, 20 youth information workers were involved, and the publication has been downloaded around 300 times. Aġenzija Żgħażagħ (AŻ) uses offline activities to gather feedback from young people as well as indirect participation tools through social media. The results of such consultation are then presented to policy makers and for EU structured dialogue debates. iParticipate aimed at looking into alternative ways of engaging young people online through the OPIN platform and generate an online/offline discussion on issues that pertain to young people and more importantly see their opinions, ideas and feedback in real time. The target group was young people between the ages of 15 to 25 years old. The project began in April 2017, after the OPIN training in Bonn. A small group of young people was formed for the project and presented the OPIN platform to the youth workers that work in AŻ’s Outreach and Community services. Between June and September, a number of OPIN projects were created. Three projects were initiated in youth hubs based in postsecondary schools that focused on the service being provided and generating ideas on how to better the service. On a national level, two other projects were held, one was focused on asking the young people to generate ideas on the possible legalisation of marijuana in Malta and the second was a poll on vote 16 +. In October, with the information collected, it was decided to do a film documentary about the process and host an offline event, during which young people had the opportunity to further discuss the ideas generated online with policy makers. Following the offline event, it was decided that a seminar on youth leaders in the community should be hosted. During this event, the comments generated by young people on OPIN about the VOTE 16 + were presented. Achievements: The national OPIN projects on the legalisation of marijuana and the Vote 16 + generated a high level of participation. The responses that young people generated on both projects were interesting and well thought out. The offline event with policy makers was a successful event, and the young people got to share their views and opinions and made the policy makers aware that young people have opinions which need to be addressed, listened to and valued. AĹť had the possibility to extend their reach to young people who are not necessarily in touch with its programmes and services. They had the opportunity to express their views and ideas online and eventually other young people who did not use OPIN built upon the ideas and comments generated through the platform. The youth hub projects were helpful to the youth workers, as with the ideas generated, they could create activities that are more appealing to young people. Description: The law that regulates the protection of minors and its implementation is important within youth work. In Tirol, the question has been raised about how to get information and advice about that law, and the issue of minor protection in general, directly to the people. Five years ago, the idea of the Jugendschutz MOBIL was born. The project is based upon a branded van and a non-alcoholic cocktail bar. The van and especially the bar is as an eye catcher. It offers non-alcoholic drinks and lot of information about the youth protection law. The colour and the tasteful drinks conveys the idea that you do not need alcohol to treat yourself to something nice. People who come to the bar can either buy a cocktail or win one in a quiz about the youth protection law – explanation of the law included. This way people are made curious and they start to ask questions about it. The “Jugendschutz MOBIL” is on tour the whole year. It can be found at a variety of events like the education fair BeSt, the open house day of the government of Tirol, the Street Festival in Mayrhofen and Reutte and many more. Achievements: The “Jugendschutz MOBIL” has been running for five years now, and each year takes part in 40 to 50 events and reaches about 80,000 young people in Tirol. 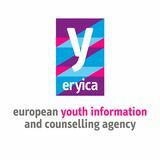 Good practice examples of youth information work in the ERYICA network.